Getting accepted for a mortgage can feel like you are being judged at the pearly gates sometimes, but even getting to that point requires a lot of decision making and work. However, there are plenty of options open to you to help make this process a bit easier; but the question of who to ask for help and advice is always a tricky one. The institutional idea of government tells us that they are elected representative that are there to serve the public interests, yet how many people will say that actually trust politicians to always have a selfless agenda, or that they agree with their opinions? The same is true across every aspect of life, how do we know who we can trust, who can give us the best advice, who will actually help us get what we want. 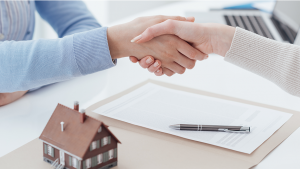 One of the biggest choices you are faced with when buying a home is your mortgage lender, but choosing your lender can be a challenge all of its own. Long gone are the days where you would walk into your local branch of whichever bank you held your current account with and asked them for whichever financial product you were interested in. These days consumer choice is far greater and shopping around is actively encouraged, but shopping around for something as complex as a mortgage can be quite tricky. You can look online, but the systems there will only be able to provide you with a very basic idea of what you are able to look at; for a more detailed and in depth analysis of your mortgage potential, you need to speak to a person. This essentially presents you with two options, speak to a banks mortgage expert or speak to a mortgage broker. This leads to your choice of who’s advice to take, and in the case of broker vs banker there are a few key differences to be aware of. Asking a banker will assure that you receive the best advice available for the products their bank offer. They will have in depth knowledge of the mortgages that their bank provide and this might well include some special offers that are only available to customers who go to them directly. They are bank employees and as such are on a salary, but might also be in a position to receive performance related benefits. What they will not be able to do is advise you on anything that their establishment doesn’t offer, so they will be unable to discuss comparative offers from other lenders. Basically, they are a sales person, there to sell their lenders products to potential customers. Mortgage brokers, such as Multi-Choice, are there to work for you, the borrower. They can examine the wider market and offer you advice on a range or products from different lenders, and they are normally paid via commission for the sale of mortgage products so should not cost you anything. Brokers are financial professionals there to offer advice and guidance on the purchasing of mortgages. 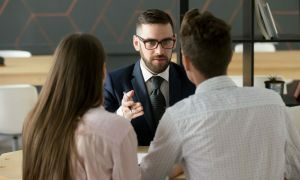 Ultimately, both bankers and brokers can offer helpful advice, but you need to decide which is going to offer you the best options for your situation.